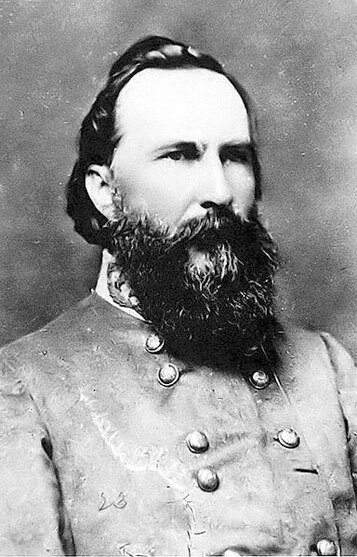 The corps was commanded at the Battle of Gettysburg by Lieutenant General James Longstreet (USMA ’42), the next senior Confederate officer at Gettysburg to Robert E. Lee. He had commanded the First Corps since it was established in the fall of 1862 and was the only experienced Confederate corps commander at Gettysburg, both Ewell and Hill having been promoted just a month before the battle. The controversy of Longstreet’s role at Gettysburg has not diminished since the battle. He made no secret that he disapporved of Lee’s plans to attack the Federal lines on both July 2nd and 3rd, and his foot-dragging bordered on insubordination. Nevertheless, the attack launched by his First Corps on July 2nd rocked the Army of the Potomac back on its heels and came close to acheiving its goals. The attack on July 3rd, of which only a third of the men (Pickett’s Division) belonged to the First Corps, was not as effective as the previous day but was still a dangerous blow. For all his faults, Longstreet was always viewed by Lee as “his warhorse” and his right hand man. And the First Corps would always be the sledgehammer of the Army of Northern Virginia. Looking west toward the Confederate 1st Corps monument. Millerstown Road is in the background. July 1. 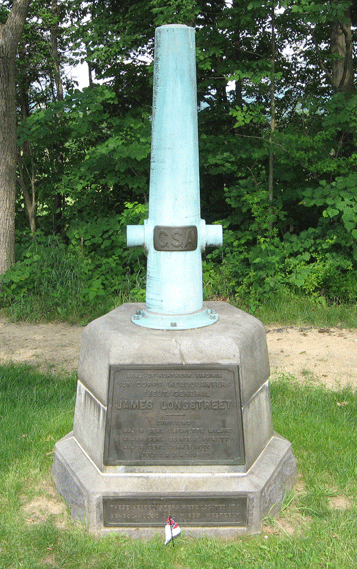 McLaws’ Division encamped about four miles from Gettysburg a little after dark. 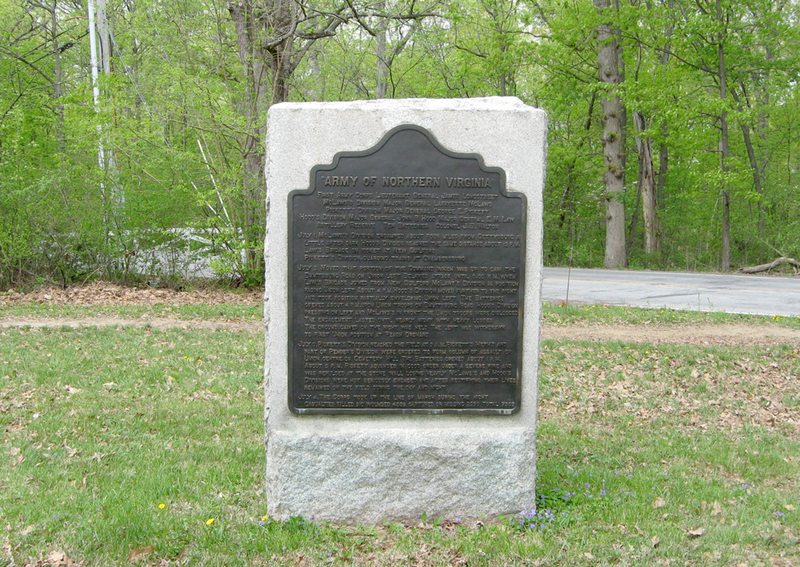 Hood’s Division reached the same distance about 12 P. M.Law’s Brigade on picket at New Guilford. Pickett’s Division guarding trains at Chambersburg. July 2. Moved that portion of the command which was up to gain the Emmitsburg Road on Union left. Delayed attack until 3.30 P. M. when Law’s Brigadejoined from New Guilford. McLaws’ Division in position facing Union left. About 4 P. M. Hood’s Division moved further to the right and took position partially enveloping Union left. The batteries opened about 4 P. M. upon Union troops on Emmitsburg Road Hood’s Division pressing on left and McLaws’ in front the Union troops were dislodged. The engagement lasted until nearly night with heavy losses. The ground gained on the front was held. The left was withdrawn to first Union position at Peach Orchard. July 3. Pickett’s Division reached the field at 9 A. M. Pickett’s Heth’s and part of Pender’s Divisionswere ordered to form column of assault on Union centre on Cemetery Hill. The batteries opened about 1 P. M. About 3 P. M. Pickett advanced in good order under a severe fire and was repulsed at the stone wall losing heavily McLaws’ and Hood’s Divisions were not seriously engaged during the day and night.